One of the biggest advantages of owning a lake home is that, unlike beaches, lakes don’t close up shop when colder weather creeps in. This is especially great news for fishermen and women who aren’t quite ready to hang up their rods for the season. Surprisingly, there are a significant number of fish that remain active (and hungry) during the winter months. To be successful at catching them though – that takes a little bit of extra know-how. But never fear, we at Lake Homes Realty have put together an essential guide to fishing in the winter. Check it out, and cast away! 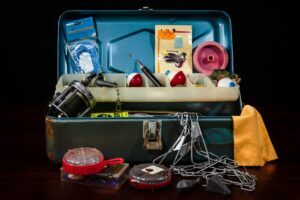 What’s a fishing trip without a properly stocked tackle box? It’s essential to landing the big one, and fishing in the winter is no exception. You’ll just need to add a few cold-weather items to the list. Extra fishing line – In the winter, a smaller sized line and line with lessened elasticity works best. Line conditioner – These sprays protect your fishing line from icing over, preventing rod and reel damage or malfunction when you’ve got a big one on the hook. Bait attractant – Winter weather tends to slow fish down both in hunting speed and metabolism. You might be surprised how applying a non-oil based, bait attractant that smells like your catch’s favorite meal can speed things up. Fish are cold-blooded creatures, which means when water temperatures drop, their internal temperatures follow suit. Because of this, fish behave differently in the winter than in warmer months. For example, you’ll find fish closer to the bottom of the lake in the winter, where water is a few degrees warmer. Additionally, not all fish are equally active when the weather changes, so it’s important to know what fish are your most likely targets, where to find them, and how to reel ’em in. Crappie – Areas with stumps and brush piles are perfect places for crappie to take cover. To catch these fish in the winter, experts recommend vertical jigging, or fishing from a slow-moving or stationary boat and using lures like blade baits and plastic grubs. Channel Catfish – If a lake reaches depths beyond 50 feet, anglers will have the most luck finding catfish at 15 – 35 feet. Beaver dams are also great places to find catfish in the winter because water moves more slowly there. For the best results, try using “local” baits, including shad and small bluegill. Perch – These fish are typically found on the muddy and rocky bottoms of fresh water bodies. Perch are attracted to sluggish, “juicy” baits such as maggots and thick worms. Trout – Trout like to congregate between 20 and 60 feet down, around rocky formations and in areas where water moves slowly. Commonly used jigs for trout fishing in the winter include Swedish pimples and tube jigs. Walleye – Sandy humps and nearby deep holes are popular haunts for winter walleye populations. Found between 20 and 50 feet, walleye respond favorably to plastic grubs with curly tails and jigging spoons tipped with minnows. Bluegill – Unlike others to make this list, bluegill prefer shallower waters in the winter, in weed beds and tall sandgrass beds. Professionals suggest using live waxworms to catch these fish. When fishing in the winter, steer clear of areas with fast currents or potentially fast currents. Plan your fishing trip between 10 a.m. and 4 p.m., when waters will be warmest. For maximum warmth, try fishing near the north end of your lake where the sun shines the strongest in the winter. Try to go out on the lake a few days before a cold front is supposed to come through. Fish are friendliest when barometric pressure is low. Act slowly, especially when it comes to moving your bait. In the winter, nearly everything underwater moves more sluggishly so it’s important to remind yourself to slow your presentation. The more naturally your plastic grub moves, the more convinced a fish will be that it’s prey. Choose lures in colors like white, transparent with colored flakes and silver. Make sure your bait has a little warmth to it from time to time. A live bait would be warm, and it’s all about tricking the fish into thinking yours is the real thing.